Description: Dark brown plastic chocolate syrup ice cream topping. This is hollow and shaped like hot chocolate on top of a McDonald's® Hot Fudge Sunday. 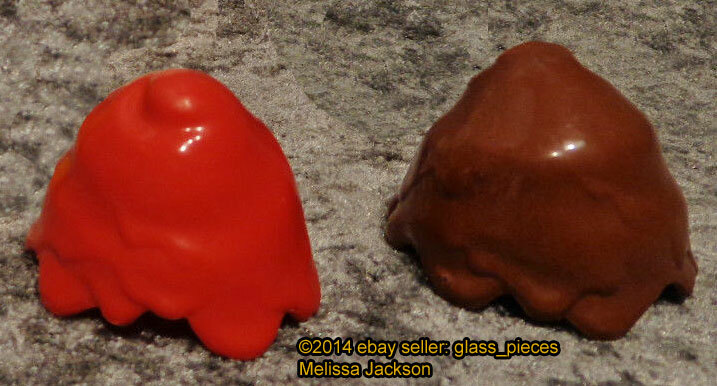 Description: Dark brown "hot fudge" icing top with a red cherry in the top middle. This icing tops fit on top of an ice cream scoop. Description: Brown (chocolate) plastic swirled ice cream with a swirled top and a long swirled bottom. This icecream fits into a FPT7031 icecream cone or a FPT7036 ice cream sunday glass. 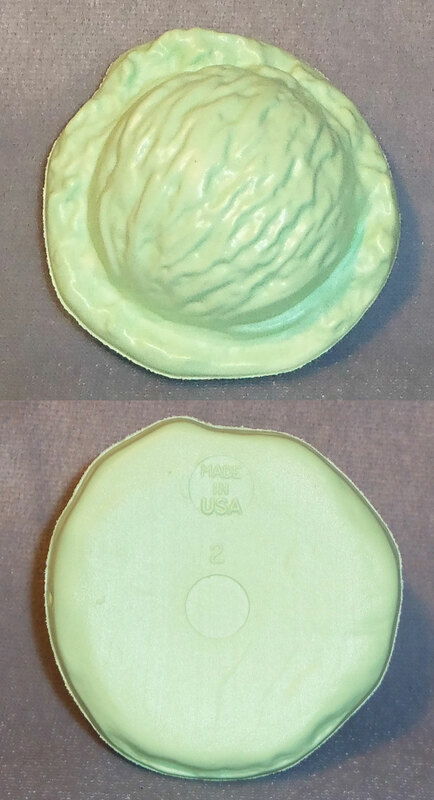 The icecream has a mold seam across the middle and is marked "©'88 F-P" on the bottom side. Measures 3-1/2" tall. Description: Brown (chocolate) plastic ice cream scoop that is round, flat on the bottom, and rounded on top, like a real scoop of ice cream. Bottom marked, "MADE IN U.S.A.". Measures 2" diameter x 1-1/8" tall. Description: Light green (pistachio) plastic ice cream scoop that is round, flat on the bottom, and rounded on top, like a real scoop of ice cream. Bottom marked, "MADE IN U.S.A.". Measures 2" diameter x 1-1/8" tall. Description: Pink (strawberry) plastic ice cream scoop that is round, flat on the bottom, and rounded on top, like a real scoop of ice cream. Bottom marked, "MADE IN U.S.A.". Measures 2" diameter x 1-1/8" tall. Description: Red plastic strawberry syrup ice cream topping. This is hollow and shaped like strawberry on top of a McDonald's® Hot Fudge Sunday. Description: Tan ice cream cone with a flat bottom and criss-cross designs on the sides. The cones is marked "McDonald's" on the top sides. Marked "©'88 F-P" on the bottom. 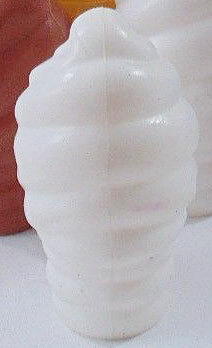 Measures 2-13/16" tall, 1-1/4" base diameter, 2-1/4" top diameter. Description: White (vanilla) plastic swirled ice cream with a swirled top and a long swirled bottom. This icecream fits into a FPT7031 icecream cone or a FPT7036 ice cream sunday glass. The icecream has a mold seam across the middle and is marked "©'88 F-P" on the bottom side. Measures 3-1/2" tall. Description: White (vanilla) plastic ice cream scoop that is round, flat on the bottom, and rounded on top, like a real scoop of ice cream. Bottom marked, "MADE IN U.S.A.". Measures 2" diameter x 1-1/8" tall.